A native of Ft. Payne, Alabama, and educated in the public schools of Orange County, Florida, and Dekalb County, Alabama, Mark E. Biddle holds degrees from Samford University, The Southern Baptist Theological Seminary, Rueschlikon Baptist Theological Seminary, and the University of Zurich. In addition to editing the Reading the Old Testament series, he is the author of Deuteronomy in the Smyth & Helwys Bible Commentary series and Judges in the Reading the Old Testament series. His new book is titled A Time to Laugh: Humor in the Bible. 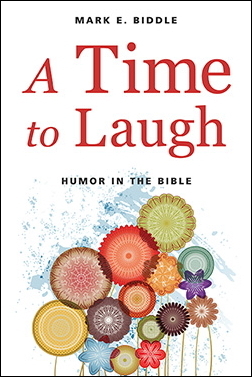 How would you describe your new book, A Time to Laugh: Humor in the Bible? In A Time to Laugh, I try to accomplish three things at once. As a seminary Old Testament professor, my vocation centers on helping my students read the Bible with greater clarity and depth. People often fail to see the Bible’s skillful portrayal of authentic human experience. They “flatten” Scripture, so to speak. First, then, I hope that A Time to Laugh helps readers see the Bible with new, more perceptive eyes. Second, in order to achieve this objective, A Time to Laugh demonstrates how to read the Bible more perceptively by means of specific example texts. Third, the fact that the Bible employs humor invites theological reflection on the significance and function of the comic in the life of faith. How did you come to write a book on humor in the Bible? I discuss this in the book, of course, but I can summarize the account. The genesis of the book goes back over a decade to when I was teaching at the undergraduate level and had an unexpected experience in the classroom that caused me to ask whether there might be humor in the Bible. Years later, after thinking and reading about the question, I began to teach a course on “Humor in the Bible” at the Baptist Theological Seminary at Richmond. It has been very popular with students; two of my students have published papers written in the class in academic journals and gone on to PhD studies in the field; churches in the Richmond area frequently ask me to speak on the topic. I am convinced that recognizing the humor in the Bible enriches our experience of the text, and apparently my students and church folk are too. I wrote the book because I want to make the insights I’ve gained through studying and teaching on the subject available to a broad audience. Why write a book on humor in the Bible? When you sat down to write, what were your hopes and goals? Well, I think my answers to the first two questions cover this in part. My objective was to write a book that opened a new vista on the Bible for believers. Perhaps the most satisfying aspect of my experience as a Bible professor is the opportunity to help students who approach the Bible as though it is a mystery begin to see it, instead, as rich, interesting, vital literature that tells the stories of people like us as they lived their lives in relationship with God. This book tries to export that classroom experience. In the book’s introduction, I get the sense that you’re wrestling with specific assumptions made by those who read the Bible on a regular basis. Is this true? Would you talk about this a little? Indeed. When I first began to suspect that the Bible contained humor, I was surprised, even a little uncomfortable, myself. For some reason, people (myself included at first) equate humor with triviality, with silliness. The Bible is certainly not trivial or silly. After some reading and, especially, some thinking, I’ve come to see that humor is, in fact, a very serious matter. It’s fundamental to human experience. As I mention in the book, babies laugh before they can walk or talk. Humor is a recognition of something out-of-kilter, something ridiculous. The Bible surely deals with the out-of-kilter, ridiculous elements of being human. The Bible tells authentic stories about real people. It’s difficult to imagine how it could tell these stories without humor. I hate to put you on the spot (not really! ), but I was hoping you might be able to briefly describe a few humorous moments from Scripture. Is there really anything funny in there? “Is there really anything funny in there?” I take it that you’re still skeptical. Okay. Two examples, neither of which gets treatment in the book: The book of Judges tells about Ehud, an early Israelite judge, and Eglon, the king of Israel’s foreign oppressors at the time. The account is rife with humor. Left-handed Ehud is from the tribe of Benjamin (which means “son of the right hand”); Ehud is a left-handed son of the right hand. Ehud disembowels obese Eglon, whose name means “calf”; Eglon is the fatted calf. After assassinating Eglon, apparently in the ancient equivalent of the toilet, Ehud slips away, somehow leaving the door locked from the inside. Eglon’s attendants smell the results of the disembowelment and hesitate to break in on their king, a delay that gives Ehud time to escape. These are but a few of the plays on words, comic situations, and inanity in the Ehud story. This is Monty Python funny. The second example is closer to what we would call a “joke” and is even a bit off-color. In an exquisite image of futility, Isaiah 26:18 says, “We were with child, we writhed, we have as it were brought forth wind.” To be sure you get the picture, I will paraphrase: “We thought we were pregnant; our bellies were extended; but our labor pains turned out only to be gas.” Pity the midwife. What was the most meaningful or surprising experience you had in the process of writing A Time to Laugh? The most surprising thing about writing this book was how difficult it is to write about humor without taking all the humor out of it. It is almost axiomatic that if you have to explain humor, you ruin it. At the same time, however, the point of the book isn’t that I can retell a biblical story so that it becomes humorous. I developed a healthy respect for humorists. I hope that I was able to maintain the balance between helping readers become more proficient at recognizing and interpreting the humor in the Bible, on the one hand, and sustaining a transparent voice that permits the humor to shine through, on the other.